View basket “2 Year Membership – Online Magazine” has been added to your basket. Three year SITFFR Foundation membership. You can buy the membership also as a gift. Just fill in the receivers details in the registration page. 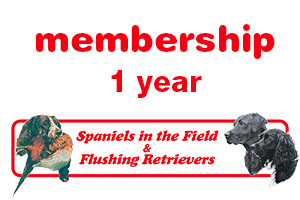 Support Spaniels in the Field & Flushing Retrievers (SITFFR) Foundation! You membership is tax deductible. Get access to monthly articles and read them first! We publish articles just for members each month. Read about training, health, hunting and more. Full access to all content and featured articles on the website and online magazine. Be the first to review “3 Year Membership – Online Magazine” Click here to cancel reply.